Albany Western Australia is Australia’s new venue for the light installation by internationally acclaimed artist Bruce Munro. The Avenue of Honour at Mt Clarence in Albany Western Australia will come alight at night with the installation of thousands of lights on slender stems. These will be ‘planted’ under the memorial trees that line Apex Drive within Albany Heritage Park. The event will coincide with the spring wildflower displays in extensive national parks of the Amazing South Coast of Western Australia. The installation will coincide with peak wildflower season and the conclusion of the Anzac Centenary commemorations, exhibiting from October 2018 through to Anzac Day in April 2019. See this extraordinary artistic installation in an equally extraordinary natural environment, by travelling from Perth flying with REX airlines, driving by car or catching a bus. Stay at least two nights and take advantage of accommodation and tour packages. Stay at Best Western Albany Motel & Apartments and include day tours with Busy Blue Bus Tours + Charters on a Short Breaks tour and accommodation package. Choose a ‘Historic Albany’ package that reflects on the ANZAC events and the story of whales in the emerging City of Albany. Choose a ‘Porongurups and Mt Barker’ package to visit the Granite Skywalk and Mt Barker wineries. Choose a ‘Tasting the Amazing South Coast’ package to enjoy gourmet foods, local produce and wine in Denmark and Mt Barker. 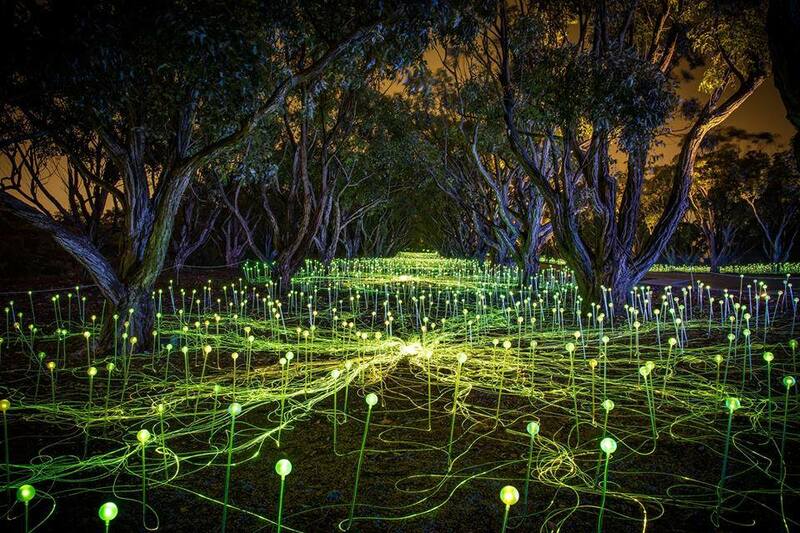 British artist Bruce Munro is best known for producing large immersive light-based installations, which often employ a massing of components by the thousands. An artistic diarist, he has spent over 30 years collecting and recording ideas and images in his sketchbooks, which he returns to over time as source material. Language, literature, science, and music have also greatly influenced his work. Frequently, Bruce’s subject matter is his own experience of fleeting moments of rapport with the world and existence in its largest sense of being part of life’s essential pattern. His reoccurring motif is the use of light on an environmental scale in order to create an emotional response for the viewer. Bruce’s work has been shown at Museums and Botanical Gardens internationally, notably, Longwood Gardens, Pennsylvania, The Victoria & Albert Museum, London; Waddesdon Manor for the Rothschild Collection, Buckinghamshire; and Beyond Limits 2016 for Sothebys at Chatsworth House. His work Field of Light continues to be exhibited at Uluru, NT, Australia. In September 2018 Bruce created Moon Blooms a permanent public art installation for the Bicester Shopping Village in Oxfordshire.